Its quite easy topic, but sometimes is confusing, especially for ADF newbies. I will try to explain today, how View Object instance works and what you should know when using the same View Object instance across different ADF task flows. This is most typical mistake, when developers want to access the same View Object from different forms, they are assuming they can access the same View Object instance. However, this may be conflicting behavior. This means, even we are using two different ADF task flows - same View Object instance is sharing same data. 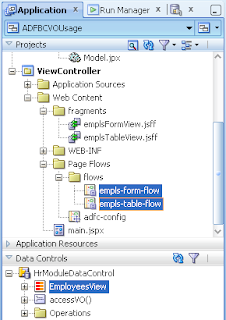 As you can see, if different ADF task flows are using same View Object, you should avoid using same View Object instance - unless its expected behavior to maintain same set of rows in both task flows (which is not often practical use case). Download sample application - ADFBCVOUsage.zip. Why can't we just clear VOCaches when we parse a different taskflow by calling clearVOCaches. I think if a person needs to reuse the same view object in 10 different taskflows one would be better off clearing the cache then creating 10 different instances. And what if two task flows will be used at same time? Then we will end up into conflict. Its most typical mistake. Hmm maybe you are correct in saying that but in that case wouldn't one want to use default behavior. Also in case one has independent taskflows wouldn't they be better off if they just clear vo caches. To clear VO caches is not typical ADF BC behavior, is more like a hack. 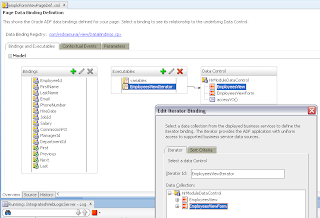 Also, even independent ADF Task Flows by default are sharing Data Control - means cache is preserved for VO's. You can run ADF Task Flows in isolated mode, then it will clean cache for you - but it will consume more DB connections, will not keep state, etc. 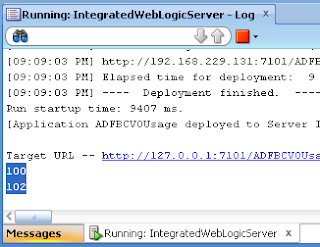 Exactly, to use different VO instances is default ADF BC behavior. There is even no need to acces VO directly for this scenario - calling CreateInsert. You can call CreateInsert operation from bindings, inside bean. Its interesting topic, i will post sample app. In java, I want to get the rows from the view object based on one particular attribute's value (may be if attr == true) and get the rowset for further processing. What I'm doing now is just getting the view object in java and iterating it in a loop based on the condition. But I don't think this would be the right way if there are large number of rows. Could you please tell me the best solution. Create another VO instance, define View Criteria and execute it to filter directly from DB. 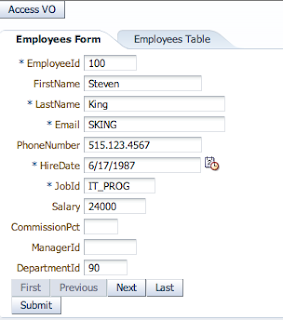 In my application, I call a procedure which inserts rows in a table say X. 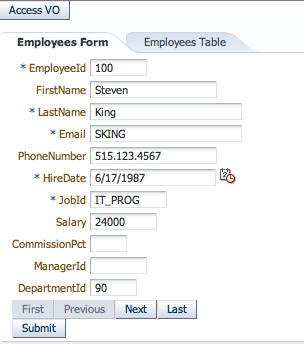 But the view object corresponding to this table is not getting updated and this is not occurring every time. (may be once in 3 times). 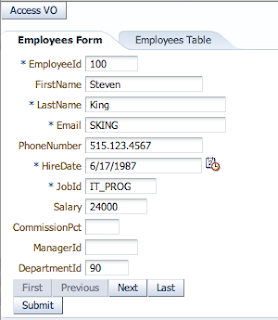 I tried using VO.executeQuery() and still the new rows are not visible in VO. But when I get the same viewobject from the viewLink, I can see the inserted rows. But how I couldn't understand. In both cases the VO instance is the same. Could you please tell me what exactly goes wrong in my implementation. How can we create an viewObject instance programmatically. Consider I want to creat a detail object instance programmatically how can i do that. Please help me in this. If I create a new View Instance, is it possible to change the number of columns in the new instance ? 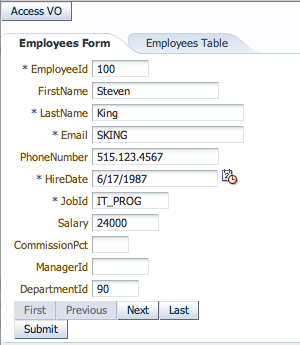 My requirement is to reduce the number of columns in the new VO Instance, as compared to the original VO. can i ask ? this is my ApplicationModule, but always display error "too many object...."
In my application, I have a table and search functionality. 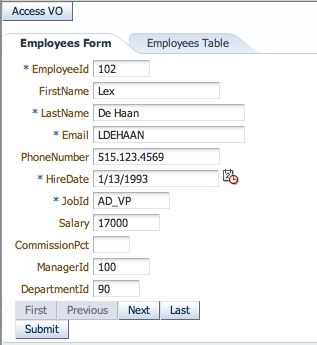 When I update any table column value it gets updated and is stored in db, when I try to search with the updated value . I get the correct row but with old value. Is vo caching data or vo's are not getting refreshed.